Are M105 Compound and M205 Finishing Polish being phased out or totally replaced in favor of the new M110 & M210? That price is pretty good. 105 and 205 are here to stay. That's good news; what's the use case then for 110 vs 105 (210 vs 105)? Or is this a "user preference" sort of thing, like when choosing your last step product? Is M105 Compound being phased out or totally replaced in favor of the new M110? That's good news; what's the use case then for 110 vs 105? Given the price points, I'd say if anything was going to be phased out, it would be M101. M110 is way more expensive than M100 or M105, so I would say they can all coexist...but M110 is coming in just slightly under M101...of course that doesn't mean that M101 is going anywhere, I'm just saying based on price alone I would say that M100 and M105 are in a different market and don't necessarily compete...I'm talking out in the world away from our little enthusiast circles. But of course I'm still waking up and maybe need more coffee. If M110 finishes like Ultimate Compound does, when in many cases there's no polishing step needed - just straight to wax, it may really become everybody's favorite compound very quickly. From the product description it looks like new generation of SMAT. Correct, 105 & 205 are not going anywhere. 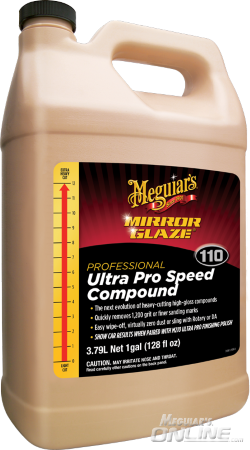 110 & 210 are now our most premium professional compound & finishing polish we offer. 110 has less dust than 100, 101, & 105, easier wipe off, and longer working time. The most exceptional feature is it's ability to leave behind a virtually micro mar, haze, & tick free surface in many situations & on many paints. You are on the right track, M101 Foam Cut Compound will likely be phased out. In case I have not mentioned, this product & M210 will be in our Distribution Center, ready for distributor order, this coming Monday, November 5th. It should be available for end user purchase another week or two after that!